Welcome back to The 4Geeks Podcast! 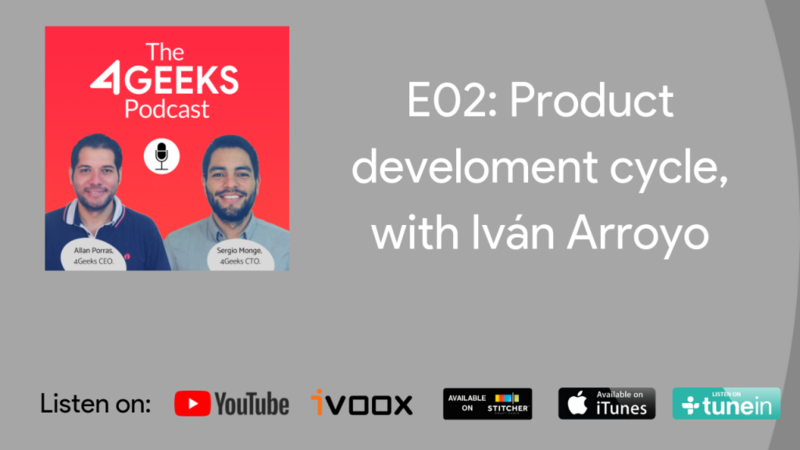 In this new episode Ivan Arroyo, a software engineer here at 4Geeks, joined us for discuss about the 4Geeks Product Development Cycle. This cycle includes Brainstorming, UX, MVP, UI, Coding, Testing and Product Release, and Ivan, Sergio and Allan discussed deeply about it on this episode. Hope you can enjoy! We also published a version to YouTube, check it out. Hosts: Allan Porras and Sergio Monge. 4Geeks is a global product design, development & market company, and all-in-between, focused on triple ROI for startups, small & medium businesses. Need help to grow your business? Request a 15 min free consultation, discover an out-of-the-box solution or simply subscribe to keep in touch. Migrate from Google Cloud Messaging to Firebase Cloud Messaging, Step by Step. © 2019 - 4Geeks Technologies, Inc.